"After all that Hezekiah had so faithfully done, Sennacherib king of Assyria came and invaded Judah. He laid siege to the fortified cities, thinking to conquer them for himself. When Hezekiah saw that Sennacherib had come and that he intended to wage war against Jerusalem, he consulted with his officials and military staff about blocking off the water from the springs outside the city, and they helped him. They gathered a large group of people who blocked all the springs and the stream that flowed through the land. find plenty of water?' they said. that one and reinforced the terraces of the City of David. He also made large numbers of weapons and shields." Part of the reformation that Hezekiah was seeking included shaking loose of servitude to foreign empires such as the Assyrians and the forced religious influence the Assyrians brought to Judah. Concerning these international relationships Hezekiah rebelled against the Assyrian Emperor Shalmaneser and then turned to defeat the Philistines who had taken territory from King Ahaz and had refused to join Hezekiah’s anti-Assyrian stance. Hezekiah then watched as the Assyrians invaded Israel, his neighbors to the north, in 725 BC and defeated then defeated Israel in 721 BC. In 701 BC Sennacherib, the next Assyrian king, began attacking the fortified cities of Judah. up water in the Lower Pool (from Hezekiah’s Tunnel). that had to be removed to build it). Akarpos (Gr) – Unfruitful (Eng) – akarpos – karpos means “fruit” and is used to refer to plants, animals, people and it is also used as a metaphor for good deeds. 2 Chronicles 8:4 says that Solomon built up the city of Tadmor in the Syrian Desert. Tadmor is 120 miles northeast of Damascus. Solomon established it for trade and defensive purposes. Tadmor eventually became well known up through the days of the Roman Empire (called Palmyra by Rome) as a wealthy customhouse for Caravans to pass through from Mesopotamia into the Mediterranean world. Today more than a mile of the remains of this city of Solomon’s can be seen including the rose-white limestone columns of the colonnade, the aqueduct, a temple and the city walls. Do I prepare for the future and make plans using wisdom? But, do I also look to the Lord who makes and provides all things? Do I trust the One who has had a plan from eternity past? the sayings and riddles of the wise." 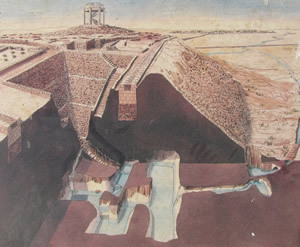 Diagram on display in Beersheba of the water system at Beersheba. 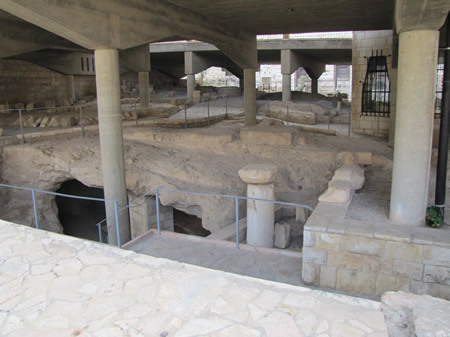 An ancient village in nazareth with Roman remains covered by Crusader remains above.